There was a very upbeat tale in the South Wales Echo yesterday, describing the military training privatisation at St Athan as “‘on track”. There had been fears that the huge project in the Vale of Glamorgan could fall victim to the worldwide economic crisis, the Echo reported, but Armed Forces Minister Bob Ainsworth had told the House of Commons on Tuesday that “considerable progress has been made in driving down costs and towards achieving affordable, value for money. The new base is now being called the Defence Technical Academy, as opposed to the Defence Training Academy (name changes are always a sign of trouble), but Vale of Glamorgan MP John Smith, has hit out at “the negative rumours that have been bandied about by doom-and-gloom merchants”. “The minister’s statement confirms what I have always maintained, that St Athan is the only location that will provide technical training for all our armed forces in a high-quality bespoke environment and purpose-built facilities,” Mr Smith said. However, over at the Defence Management Journal, the experts paint a very different picture – and rabid leftie peaceniks those boys ain’t. They are, however, “doom-and-gloom merchants”, describing the Government’s Defence Training Review (DTR) as “oft-delayed, over budget and controversial” – all elements of the DTR which have been regularly reported at What Is Wales? “Numerous MPs have told Defence Management that the DTR’s funding is heavily reliant on the sales of vacant MoD properties,” it reported yesterday. “The current financial crisis has not allowed the MoD to do this which has delayed a final financial agreement. The MoD’s project leader Brigadier Geoff Nield said in a statement that the MoD was committed “to continuing with the current assessment phase”. He acknowledged that there have been affordability challenges and that this had forced Metrix, the leader of package 1, to re-examine its proposal. Ultimately, the St Athan training programme which was to begin in 2012 will now be delayed until 2014 at the earliest, Defence Management reported. Much scrutiny of the nationalisation or part-nationalisation of various banks. If only there had been as much investigation over the years of Labour’s love affair with privatisation. It started with the air traffic control service and continues in defence. This month an RAF engineer highlighted the appalling state of accommodation at St Athan in the Vale of Glamorgan. “The MoD sent us to a welfare house while our quarters were fumigated…the place they gave us was disgusting, with ripped carpets, filthy cupboards and kitchen doors hanging off their hinges,” said the serviceman’s wife. Local MP John Smith said: “I am deeply concerned. The problem here appears to be that the property was absolutely filthy and that could not have happened 20 or 30 years ago. The entire housing stock of the MoD was sold to a Japanese bank? Who knew? And, yes, this is the same John Smith who is drum major for the massive sell-off which will put the training of all three British armed forces into private hands. The Government’s sell-off of military training continues to go badly. It is planned that a consortium of private companies (the Metrix Consortium) will set up and run the massive new St Athan training academy. Other training sites are to be closed with the land sold off to raise funds by Metrix. One of the sites expected to go was RAF Cosford in Shropshire. But now – with the credit crunch biting and few developers queuing up for the MoD land sell-off – it appears that might not be so. According to the Defence Management Journal, Cosford’s closure might be put on hold during a review of the Government’s scheme, which is known in official circles as the Defence Training Rationalization. “The DTR is facing an extended period of difficulty and a full blown financial review because its financing was dependent on the sale of surplus MoD land,” the DMJ reported yesterday. “Now the MoD may have to keep the RAF Cosford open as a contingency plan in case the deal at St Athan collapses. Who will be training their soldiers at the new Defence Training Academy at St Athan? It’s a question that’s been exercising campaigners who feel the development is not just pledging Wales to a future of “militarism”, but wondering to whose military we are making that pledge. I mean, we are never going to stop people killing other people. But does it look like we even want to? Especially if private security companies – like the ones fighting wars for ‘us’ by proxy in Iraq – will be getting trained there. 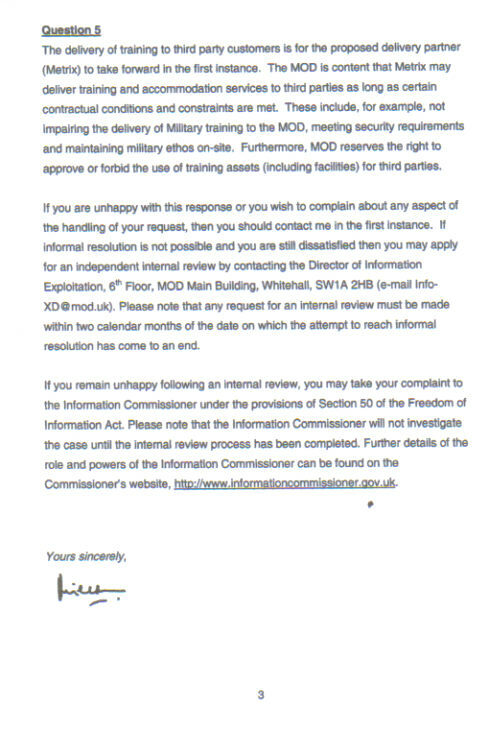 I contacted the Ministry of Defence under the Freedom of Information Act to ask if, for instance, the MoD would ban any particular nations from using the training camp. And what about private security companies – would they be able to send personnel there? 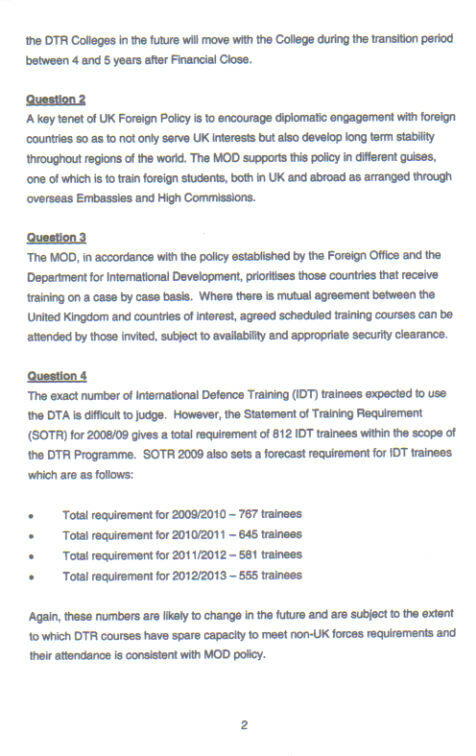 After a short delay I received an email from Brigadier Geoff Nield, a project leader with the Defence Training Review. 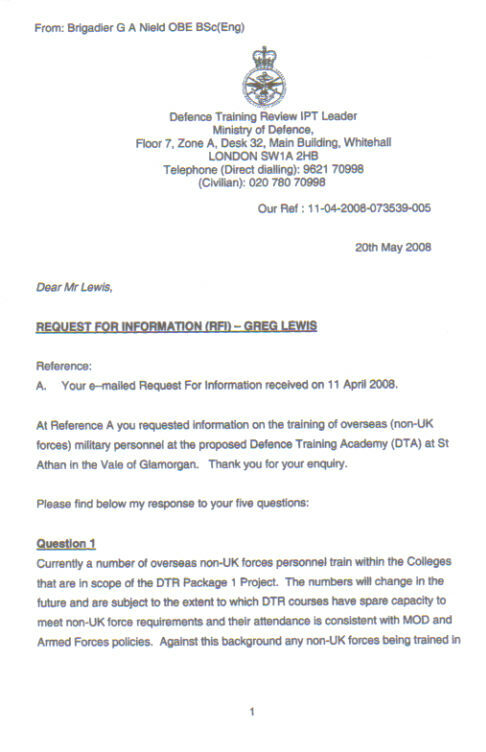 Under this privatised scheme, it seems, the first decision on who comes in from the outside for training is down to the Metrix Consortium – a group of arms/defence companies and educational establishments like the Open University. “The MoD is content that Metrix may deliver training and accommodation services to third parties as long as certain contractual conditions and restraints are met,” said Brigadier Nield. “These include, for example, not impairing the delivery of military training to the MoD, meeting security requirements and maintaining military ethos on-site. So, could a regime like Burma for instance, on paying the right fees, get its soldiers trained here? After all, Britain kindly sold more than 40 Hawk aircraft to the Indonesians during the 1980s and 1990s before world attention suggested that helping the country suppress the East Timorese did not make Britain either great or a land of much hope and glory. There is, some might say, an Orwellian feel to the response. The MoD insists on calling the centre a “college” and the non-UK attendees, “students”. In addition, the MoD also states that the training of private contractors and foreign armies is actually about making a stable world for our children’s children. War is peace, then, after all. Protesters say they’ve found the first chinks in the armour of the arms and defence consortium behind the new St Athan training academy. Much is being made about the educational courses which will be on offer at the massive base – and the Open University’s involvement in the Metrix Consortium is key to that. It seems people within the OU have been asking similar questions. Following a demonstration outside the OU offices in Cardiff recently its Wales director Rob Humphreys said its involvement was about “delivering the highest possible quality of support” to Britain’s armed services. However, when I pressed the OU on claims that staff had been contacting demonstrators with messages of support and that there might even have been discussions about leaving the consortium, the OU was less bullish. “Any community as large in number and as diverse in opinion as the Open University will include people who hold differing views about some of their organisation’s activities,” came the response from its Milton Keynes HQ. “More than anywhere else, it is in a university that such diversity of opinion and discussion of issues are – and should be – found. In this case, a very small number of staff have raised concerns about the University’s involvement, and their concerns are noted. Watch this space then, as the old gossip columnists used to say. Comedy’s hot property at the moment is Wales-made ‘Gavin and Stacey’ and in a recent programme Gavin and his mum had problems at the Severn Bridge when they couldn’t find cash. Welsh Lib Dem leader Mike German spotted an opportunity for a press release. Far better for Mr G to continue with his other campaign – reported only four months ago – to get the charges scrapped. As he pointed out then, the tolls on both bridges have already raised £684m – more than double the cost of the 1996 second crossing. And there’s no sign of a free crossing for some time to come. In February UK transport minister Rosie Winterton said the tolls would have to raise £995,830,000 before motorists would stop shelling out. No laughing matter at all. The Open University is apparently facing pressure from its own staff over its part in Metrix Consortium, the developers behind the St Athan military training academy. I’ve spoken to OU about these concerns and about whether it is considering pulling out of the consortium – the full report is in the Big Issue Cymru (April 21). Thanks to Luther ap Blissett for flagging this up. Hold The Front Page has reported journalists’ concerns about provisions in the Counter-Terrorism Bill which could affect media investigation and reporting. These include new offences of eliciting, publishing or communicating information about members of the armed forces, new search and seizure powers and new ministerial controls over inquests. The Newspaper Society has written to Home Secretary Jacqui Smith. The BBC’s Dragon’s Eye entered the fray last night to raise questions about the actual number of jobs to be created at the St Athan military training academy. The programme probed claims that the base would create 5,000 jobs. The PCS union claims the privatisation of training services is about “job relocation rather than job creation”. Vale of Glamorgan MP John Smith remained bullish, having staked his reputation on the development. He claims the 5,000 jobs figure might even be an under-estimate. What Is Wales? has long felt the 5,000 new jobs claim just doesn’t add up. As long ago as July 2007 I focused on a report by Cardiff University’s Stuart Tannock which questioned how “many high quality new jobs” will actually be created for locals. Local people might feel they deserve further proper scrutiny of the St Athan project.